Have you ever spent time cleaning a particular area of the house only for it to become a mess a short time later? That seems to be a running theme in houses all over the world. Cleaning your home is something that is never ending and you have to constantly be doing the same chores again and again. We are all okay with this and have realized that it is the way it is. When it comes to your carpets you don’t want to deal with the same problems that you do through the rest of the house. The problem is that a spill that occurs on your carpet has to be cleaned and treated to have it removed. The issue is when the stain shows back up after you have already spent the time to clean it! Now you have to work on the same spill again and that can be extremely frustrating. If you don’t know why this is happening to you when you clean stains off your carpet they will just continue. Knowing the issue is the first step in correcting what is happening and prevent it later. Carpet Wicking: One of the top reasons that a stain shows back up on your carpet is from not cleaning it properly. One outcome is that you will have what is called wicking when you think you are done with the cleaning process. The spill when it is in some type of liquid form will soak in the fibers, backing and padding. When you go to clean the spill often people are only getting the area that has affected the fibers. Once the area has dried after you have finished your cleaning process the stain will come back up! That is because the liquid that has been trapped in the backing and padding will show back up in the fibers. You need to be sure that when you clean a spill that you take time to get the moisture that is all the way in the deepest part of the carpet. If you are not able to do that it is best to call out a professional that has the ability to get deep in the carpet and backing. Rapid Re-Soiling: The next problem that you are going to come up against is due to the cleaning process again. You might have gotten the stain all the way down to the backing and padding but the solution that you used is leaving behind residue. When there is residue that is left on the carpet it will cause rapid re-soiling. The other surrounding areas of the carpet will not attract the same amount of dirt that the area with residue will. The residue is a sticky substance that will attract dirt and debris and that will attach to the same area you just cleaned. This will make it look like the stain has reappeared but it is actually a new stain. Leading Carpet Cleaning offers expert carpet cleaning and stain removal. Our cleaning process solves any carpet wicking and rapid re-soiling problems. Contact us today! With the New Year here and people doing their best to adjust their budgets, there are areas of your life that you need to reduce. At the end of the year there are several things that people spend money on in excess. That is why at the first of the year it is a good idea to look at the money you have spent and where you can save. You want to make sure that you take care of your home because it is a huge investment and the place that you want to feel comfortable and safe. One way to do that is to make sure that it is clean. The carpets and flooring are important to care for because they are prone to become dirty. They are walked on and occasionally spilled on that leave them messy. The carpet is also something that you want to have last which is why caring for them is paramount. 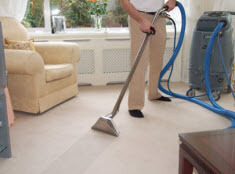 The best way to do that is to vacuum the carpets on a regular basis and budget to have them cleaned professionally. How Much Square Footage of Carpet is there to Clean? : When you call to have your carpets cleaned the service person will often start with how many rooms you are having cleaned. There are some rooms in your home that have tile or hardwood so you need to know what rooms are carpeted. The reason that we are asking how many rooms you are having cleaned is so we can come up with some type of size estimate. The number of rooms is easier to answer then the square footage. If you choose to have three rooms cleaned but one happens to be a very large room you want to ensure that you let the cleaning company know. We may charge more for a room that is not the standard size. That is because the technician will take more time and use their solution and equipment more. Cost of Pet Carpet Treatments: This is a question that you will be asked when you have your carpets cleaned. If they do not ask it is a good idea to let us know. The reason that you are wanting to tell them is because the spots and stains that a pet leave need to be treated and also neutralized because of odor. The treatment may be a little different if you are concerned about pet stains and odors. High Traffic Carpet Areas Need Pre-Treatment: Do you have a busy house that has lots of people that are coming and going? When you look at the carpet can you pin point the areas that the traffic seems to flow. That is called a high traffic area and often looks darker from soil than other areas of the house. Be sure to let them know what areas you are concerned about especially if they are high traffic. We may want to do a pre-treatment to these areas so they are working before the main cleaning occurs. 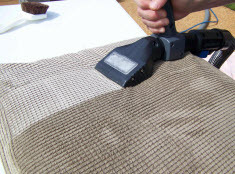 Leading Carpet Cleaning offers professional cleaning and restoration services. Contact us to book an appointment today and protect your investments. Carpets in homes and businesses are often forgotten with how important day-to-day maintenance is. Busy lifestyles, poor habits, or even lack of education can quickly bring down the aesthetics, condition, and even reduce the lifespan of the carpets. In an effort to extend the years past the life expectancy, keep your carpets in optimal condition and with it looking beautiful and vibrant, routine maintenance and professional carpet cleaning play a role. In an effort to help your goals of better carpet care, we at Leading Carpet Cleaning would like to review the basics in maintenance. 1) It is essential that you immediately treat spots and stains with your preferred carpet stain remover cleaner the instant the carpet is assaulted with foreign liquids or stain causing debris. For a DIY all purpose carpet stain cleaner mix ¼ tsp of a bleach-free liquid detergent with 1 cup of cool water; don’t forget to perform a patch test in an inconspicuous area and only blot stains, don’t scrub. 2) The patch test should never be skipped, no matter if it is a product you always use, a DIY mixture, or anything in between. Perform the test off in the corner in an inconspicuous area. If the cleaner compromised the fibers or the color it can be easily avoided and the damage isn’t in an obvious spot. 3) For preventative treatments, be sure to re-apply the stain-resistant protector to your carpets following a professional cleaning as they do dissipate over time. These treatments can help your carpet resist stains and spots, making accidental spills easier to clean. 4) Especially in high traffic areas, it is essential the carpets get vacuumed every night. We know busy schedules and fatigue can prevent the maintenance, at the minimum, vacuum 2-4 times a week in the high traffic locations, and low to no traffic areas hit the vacuum on them weekly. Excessive dirt and particles that stay on the carpet in conjunction with foot traffic creates friction, much like a sandpaper effect and there is no such thing as too much vacuuming, it will not damage the carpets, but dirt will. 5) Place walk-off mats on both interior and exterior points of doorways to help reduce the amount of dirt and debris your carpet absorbs; and to maximize the prevention, invest in runners and area rugs. 6) ON the subject of rugs, be sure to vacuum under them every time you vacuum or at the bare minimum once a week. The carpet needs to be routinely vacuumed before any damage occurs from the loose dirt that is trapped between the rug and the carpet. Vacuum both the top and backside of the rugs routinely as well. 7) Before placing the rugs and runners on the carpet, test to them for colorfastness to ensure the dye does not bleed; it is fairly common for them to do so. 8) The vacuum should be cleaned once a month and the filter replaced every 6 months to optimize the efficiency. Clean the interior and exterior, consult your manual on which detachable parts can be cleaned. 9) To keep your carpets colors from fading, utilize blinds, curtains, drapes, UV protecting film, or other such window treatments to block the direct sunlight. Additionally, rearrange the furniture annually to create new foot traffic pathways to even out wear. 10) Invest in professional carpet cleaning 1-2 times a year in addition to annual upholstery cleaning to ensure the filth that has been penetrated deeply is removed, stains are lifted, and odors neutralized or even prevented. When you are due or simply need your carpets and upholstery cleaned by a reputable professional, call in the experts of Leading Carpet Cleaning for services and our professionals will get your carpets fresh and clean. There are a number of materials used for tile, and each requires their own needs when it comes to cleaning and care. When it comes to a deep professional cleaning, it truly pays to use the professionals. There are a number of benefits when using a professional tile and grout cleaning service. Leading Carpet Cleaning will share some of the benefits of using a professional tile and grout cleaning service for any type tile material used in your home. When a professional cleans your tile, be it anything from marble tile to ceramic tile, we can give tile and grout a renewed look. When tile and grout looks dirty and old, it has an affect on the entire room. After a professional cleaning, your tile can look new just as if it’s been freshly installed. With clean tile and grout, your entire home looks and feels cleaner. When a professional cleans both tile and grout, we can remove all mold and bacteria that is found on the surface. Research has suggested that after a professional cleaning, where tile cleaning machines and disinfectant cleaners are used, the surface is completely sterile which is why most hospital use tile. When it comes to deep cleaning run down tile or grout, sometimes it can get damaged by those who don’t know the needs of certain cleaning methods for the different types of tile. Marble or natural stone tile needs much more consideration on how it is cleaned then ceramic or porcelain tile. When hiring a professional tile cleaner the cleaners are trained in how the different material types are cleaned and with the right cleaning solutions. To guarantee a deep cleaning without damaging the tile, you will find using a professional cleaning service is a great benefit. Professional grade tile cleaners are far more superior than any other cleaner on the open market. Especially when it comes to cleaning grout. Grout is extremely porous and holds bacteria and grease deep down inside the grout. Professional grade cleaners penetrate deep down dissolving grease and kills bacteria and molds. When you have your tile professionally cleaned it not only restores but extends the life of your tile. Keep in mind that natural stone, which is more sensitive to acidic elements that damage natural stone, professional cleaners can help remove all acidic elements that can damage and ruin your tile. Professional tile cleaners come prepared with the equipment and the cleaning solutions that make deep cleaning the tile go quicker and get the job done right and in half amount of the time normally involved. If your time is limited and you don’t have the time or means to clean your tile, we can provide the deep cleaning you seek. The greatest benefit is the quality of cleaning you will receive. Tile and grout, like any other floor, will need a deep and thorough cleaning from time to time. 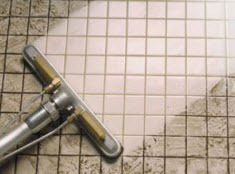 When your tile needs cleaning, Leading Carpet Cleaning provides quality tile and grout cleaning services. If you’re looking for all the many benefits of having your tile and grout professionally cleaned, contact Leading Carpet Cleaning and schedule your tile cleaning today. The average person will spend approximately a third of their life in bed. As we sleep, sweat, dead skin cells, hair, dust, and other contaminants, allergens, and debris is soaking into the fibers. Considering the accumulation of filth, it is an atrocity that people often neglect the need to clean the mattress though it is one of the essentials. Apart from washing the bedding once every two weeks, the mattress needs to be cleaned and manufacturers recommend the mattress gets cleaned by the owner every 2-3 months and by a professional 1-2 times a year. Maintaining a clean mattress contributes to improved health and sleeping habits as well as increases the mattress lifespan while being kept in optimal condition. In an effort to help those wanting the optimal clean for their mattress in between professional cleanings, we at Leading Carpet Cleaning would like to offer an effective method in cleaning the mattress. 1) Get the Mattress Ready. Get the sheets, pillow cases, blankets, and comforters started in the washing machine according to the directions indicated on the tag. Using a vacuum’s hose and the upholstery attachments, methodically vacuum the entire mattress including front, back, and all 4 sides. Especially focus on the seams and divots as that is where the particles tend to accumulate more so. 2) Neutralize and/or Prevent Mattress Odors. The sweat alone can cause the mattress to develop odors over time and add other factors, the likelihood only increases. To neutralize the smells and to also prevent any from occurring, blanket the surface of your mattress with baking soda and let it sit for 30 minutes or so. To add more fragrance, you can sift the baking soda with 5-10 drops of your favorite essential oils. Vacuum the mattress, ensuring all of the particles have been removed. Baking soda alone will not lift stains and in this step is only used to control odors. 3) Remove Mattress Stains & Spots. In the event that your mattress bears any spots or stains, create a paste by adding drops of baking soda together. Once you have made a paste of fairly thick consistency, add a few pinches of salt. With a toothbrush, apply the paste directly to any spots and stains, gently working the paste into the blemish. Allow the mixture to sit for 30 minutes before vacuuming the remnants. If necessary, follow up with a damp cloth to remove the final residue. If any stubborn stains linger, combine 1 part mild liquid dishwashing soap and 2 parts hydrogen peroxide. Use a toothbrush to sponge the mixture to the stain, agitating it as you go and let it sit for 5 minutes. With a damp cloth, wipe the area clean. 4) Thoroughly Dry Mattress. Before remaking your bed, the mattress needs to be fully dry. To expedite the process turn on the ceiling fan if applicable, set out portable fans and if the weather permits, open the window. 5) Mattress Rotation. Every time you clean the mattress, it is important to flip it over and rotate it counter-clockwise to help even out the wear. When your mattresses are due for a deep professional cleaning, call in the specialists of Leading Carpet Cleaning to get your mattress clean, sanitized, and deodorized.